All major events of human history elicit responses as varied as the personalities and situations represented by those affected. No one witnesses a world-changing event without being affected in some way. The greatest event in human history, the resurrection of Jesus Christ, is no different. Responses then were wide and varied, but everyone was affected. These four sessions deal with responses to Jesus’ resurrection. The first lesson includes Mary Magdalene, Peter, John, and the disciples in Jerusalem. Some of these people were relatives, others devotees, and a few Jesus’ financial supporters. Most were distraught over the empty tomb. Jesus had told them what would happen. 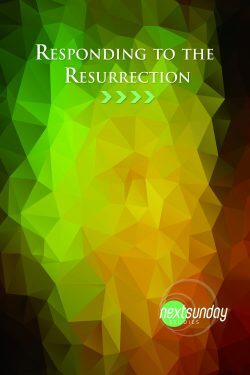 Why were they not expecting the Resurrection? Lesson two continues an examination of the first day after the Resurrection, looking specifically at the emotion of fear and the depth of disbelief apparent in the disciples. How can fear become a positive influence in our lives? The text for the third lesson is not often explored by scholars or by Bible study groups. This lesson deals with the attempted cover-up of the Resurrection by the Jewish religious authorities. How were the priests driven to such depths of action? What were they thinking? How were the guards affected, both by the Resurrection and by the reaction of the Temple leaders? Session four returns to the Gospel of John to examine Thomas’s response to the Resurrection. Although Thomas is universally known for his doubt, this study will examine the possible reasons for his doubt and look at the confession he made when he saw Jesus alive. Studying the response of early followers helps us to shape our own response to the resurrection of Jesus. Each of us must consider our response to Jesus’ life, teachings, death, resurrection, and call on our lives. How do you respond to such a historic and faith-shaping event?